YouTube is finally back on the Amazon Echo Show following a roughly two-month absence after Google disabled access, citing violations of terms of service. At the time, Google claimed the device created a "broken user experience," which appears to be shorthand for the way the Show originally didn't let you engage in secondary YouTube activities such as sharing playlists. Oh, and it originally disabled ads. Feel free to put the pieces together. So, yes, it's back. Unfortunately, as VoiceBot shows, it's a decidedly less ... pretty experience. Essentially, it looks as though Amazon complied with Google's terms of service by merely replacing the Show's custom YouTube interface for individual videos with a display showing the standard YouTube homepage as you see it on a desktop browser. Some users were reporting that videos no longer expand to full-screen, but apparently that's not the case. Simply say "Alexa, zoom in" while playing a video and it should work fine. On the bright side, the old interface remains in some form when you're merely searching for new videos, and you can still use voice command 'scroll right' to see additional videos. Amazon released a statement to VoiceBot announcing that the return of YouTube also brings support for some other video services as well. "We’re excited to offer customers the capability to watch even more video content from sources such as Vimeo, YouTube and Dailymotion on Echo Show. More video sources will be added over time." Which means they'll also likely be displayed in the same way. 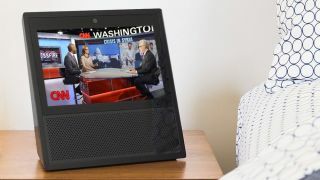 On the bright side, the return of YouTube once again makes the Echo Show an appealing prospect for a Black Friday buy. We predict that Amazon will eventually offer the device as part of its Black Friday deals, so be sure to watch TechRadar for updates.